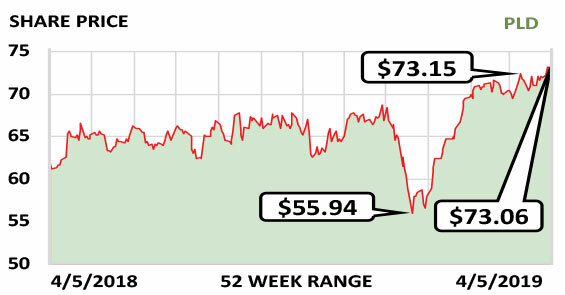 This week’s Stock of the Week is highly focused on serving an industry that’s set to expand. Prologis, Inc. (PLD) leases distribution facilities to more than 5,000 business customers, primarily those involved in business-to-business operations and retail/online fulfillment. It is a real estate investment trust (REIT) and the largest industrial real estate company in the world. Its niche is a highly valuable one that would cost a lot for competitors to enter. Prologis owns or has co-investments or development projects totaling 768 million square feet of space in 19 countries. But the stock has been trading at a discount to the average REIT in its field because of short-term pullbacks in the industrial real estate marketplace. That will change over the next several years as a scarcity of new space and increasing needs for fulfillment of online orders combine to make Prologis even more dominant. While waiting for the stock to regain momentum, investors get a dividend of $2.12/share/yr., recently yielding 2.9%, which appears secure. Both revenue and earnings continue growing steadily. Revenue was $2.3 billion last year and likely will be $2.5 billion this year and $2.98 billion in 2020. Fiscal year: December. Earnings per share: 2020 est./$3.22…2019 est./$3.14…2018/$3.03.